Onalaska, WI, September 19, 2013, 5:05 am -- /EPR NETWORK/ -- The publication of Boomerang! Leadership Principles That Bring the Customer Back has been announced by 9th Street Publishing of Green Bay. The book is written by Dave Skogen, chairman of the board of Skogen’s Festival Foods and a native of Onalaska, Wis. In Boomerang!, Skogen provides insights and lessons based on his experiences over a period of nearly six decades in leading Festival Foods’ transformation from a single 3,000-square-foot grocery store into a regional supermarket chain. 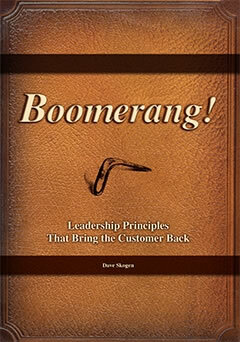 The book’s underlying idea is “the boomerang theory,” the fundamental principle that extraordinary hospitality rather than ordinary customer service brings people back and that organizations that go the extra mile can inspire customers to go the extra mile for them. Prior to taking on the role of chairman at Festival Foods, Skogen served as CEO and president of the company for more than 30 years. He has also served in leadership roles with numerous community organizations as well as industry organizations including the Food Marketing Institute. He received an honorary degree from the University of Wisconsin-La Crosse in 2012. Festival Foods is a family and employee-owned company that was originally founded as Skogen’s IGA by Skogen’s father and mother in 1946 in Onalaska. Today the company operates 18 stores across Wisconsin and has more than 5,000 employees.